The first banding of the season! I met Mary at the museum at 8:30am all geared up for the first leg banding trip of the season. At 9am, Mary, Isabel (a graduate student at UIC doing a genetic study of the Chicago peregrines) and I packed into Mary’s car and got on the road. First stop, the zoo to pick up John the vet tech. Next stop, Pilsen! We arrived at the Pilsen building 45 minutes later, just as Matt pulled up. He had his 9-10 year old son, Sean, with him – a very delightful young man. Sean had his camera along and was planning to take pictures for an end of the year presentation to his class. What a cool presentation that is going to be! Dan, the building manager, met us at the entrance and we all exchanged pleasantries as we piled into the elevator headed up to the 10th floor. As I’ve mentioned, the Pilsen site is in a very large, 1920’s era factory that now houses a storage company. The upper floors haven’t been renovated yet, so they completely lack light. In preparation for the banding, Dan had kindly set up a small folding table near the fire escape door with a shop light dangling over it. 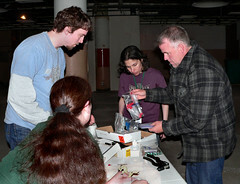 As the team went into action setting up the banding area, Dan opened the door to the fire escape. With so many helping hands along, I figured it might be more important for me to see if I could catch a look at the female’s legbands. I peeked out the door while motioning Sean over. 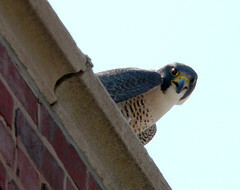 The female swooped about in the air screeching as the male sat menacingly on the fire escape rail, staring directly at us. I found out that Sean had been to a couple of bandings with his dad, but only up in Evanston, where the chicks are banded inside the library on the second floor, far away from the adults outside. Consequently, Sean had never been that close to one of the adults. He was enthralled by L/N and took picture after picture. Finally, it was time to get the chicks. Matt donned protective gear and crawled the short distance out onto the ledge. Although both adults dove very near him, he didn’t get hit once on the way there or the way back. Sean seemed beyond proud as he watched his dad grab the chicks. “Pretty cool what your dad does, huh?” I said. “Oh yeah. REALLY cool,” Sean said, grinning widely. 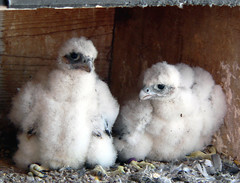 The first chick was a male. Mary banded him, John took blood samples and then we all watched as John deloused him and rubbed his belly to shake the dead bugs free. This year, as last, we are trying to collect any bird lice we get for a post-doc studying bird lice genetics. Mary put a couple of the tiny insects in a glass vial, placed the male gently back into the holding box and brought the other chick, a female, out for banding. As the group began banding the female, I propped the fire escape door open just a smidge to see what was going on outside. After 5 minutes of watching the adult female blur around in the sky above me, she finally landed. I snapped as many close-up pictures as I could, hoping one of them would be clear enough to finally identify her. Sean and I tried and tried to get shots of the female careening around in the air, but she was too fast. We shut the door after a bit, hoping that the pair would calm before Matt had to go out to put the babies back. Sean and I scrolled through and compared our pictures – I really think he got some great shots – while the banding wrapped up. Matt donned his protective gear again and took the two freshly banded babies back out to the nesting box. Sean and I snapped a couple more pictures of the chagrined-looking chicks staring at us from the box before we shut the fire escape door tight and made our way back down to the lobby. After the farewells, Mary and I took John back to the zoo and then swung a bit southwest towards the St. Michael’s church site. The woman who monitors that site, Dawn, has reported very little bird activity in the last couple of weeks, so Mary wasn’t sure if we’d see anything. 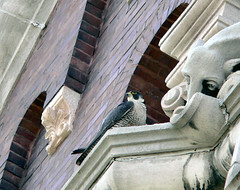 St. Michael’s Church is a relatively new nesting site. A 2-year old female named Sadie (born on the IPL Stout plant in Indianapolis, IN) and a 2-year old male named Hops (born on the Miller Brewing Company building in Milwaukee, WI, hence the name) established the nest, on the north side at the feet of a large St. Michael statue, in 2005. They successfully fledged three chicks that year, all of which were unbanded due to the inaccessibility of the nest. The next year, a new female came into the area and unfortunately, Sadie was killed in the ensuing territory dispute. The new female, 2-year old Kelliwatt, hailed from the J.M. Stuart Power Plant in Aberdeen, Ohio. 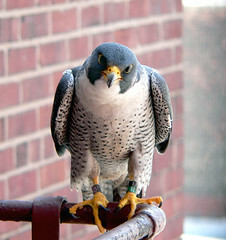 She and Hops successfully fledged four chicks in 2006. Well, semi-successfully. Apparently, there were an abnormal number of chick groundings last year. I didn’t realize that as it was my first year on the project and I thought that’s how it always went. But no, it was Abby Normal. All four St. Michael’s chicks grounded, two of them several times, so we got to band every one. In November, Mary and I were called out to a building on Lake Shore Drive. A pair of peregrines had taken up residence on the roof of a penthouse balcony and it looked as though they were setting up shop to nest. The residents had some questions. While we checked out the situation, I got clear pictures of the female and her legbands and so we were able to later identify her as Ballistic, a one-year old from Bohn, Ohio. The male was present as well that day, but we never were able to get his legband numbers. In March, Kelliwatt and Hops were back at St. Michael’s and all seemed well. Until a new female rolled into town. Dawn witnessed three adults in the area and some aggressive interaction. And then, sadly, one day she spotted Kelliwatt puffed up on the nesting ledge with a large stream of blood coming over the edge. An egg was found on the ground not that long after, also covered in a large amount of blood. Kelliwatt soon disappeared. Unlike Sadie, we haven’t ever found a body, so we all hope she went off and healed up somewhere, but that seems unlikely given the blood loss. We probably will never know. Shortly after Kelli disappeared, Dawn wrote in to report a new female and ‘lo! It was Ballistic. Since that time, Ballistic and Hops have been seen in the area, but it doesn’t seem like they are nesting. Maybe next year. 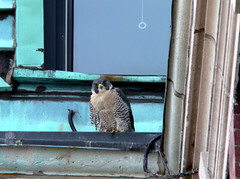 Mary and I pulled into the parking lot of St. Michael’s and scanned the church – no peregrines. We gathered our things and wandered churchward. I caught some movement in the corner of my eye and turned to see an adult peregrine coming in from the northwest. It landed on the ledge at St. Michael’s feet. Neither Mary nor I had our spotting scopes, so for the next hour, we risked extreme eye strain trying to read the bird’s legbands. We completely agreed on the black over green coloring and tentatively agreed that the top number looked like two numbers. Kelliwatt’s top number is “60” and Ballistic’s is “69”, so it could be either/or. At long last, we gave up and headed back to the museum, making a plan to come up the following week with scopes and try again. ~ by Steph on May 22, 2007.